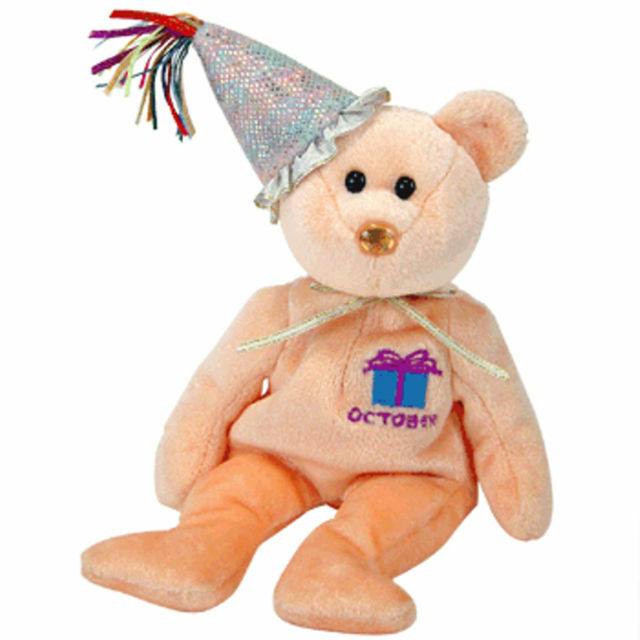 The October Birthday Bear is peach coloured and features black button eyes and a transparent peach coloured button nose. She wears a sparkly silver party hat with colourful tassels sprouting from the top of it. Around her neck, she wears a peach coloured satin ribbon and embroidered on her chest is a Birthday present with the word “October” stitched in purple thread. October was released on 29th August 2002. She doesn’t have a Birthday. This is the second Birthday bear released for the month of October. Inside the swing tag, it states the names of famous people who have their Birthday in October. However, one of the dates was wrong. It says that Martin Luther King Jr’s Birthday was 23rd October. This is incorrect as his Birthday was on 15th January. It was in fact his son, Martin Luther King III who was born on 23rd October. She was retired on 27th December 2002.